Chloe Trevor was the violin soloist on “Tango” by Carlos Gardel for the Conservatory Gala on Friday at the Community Concert Hall at Fort Lewis College. Conductor Arkady Fomin led the orchestra, which totaled 72 musicians. Peppered with sparkling solos, Friday’s Conservatory Gala turned out to be a celebration on many fronts. Every year, Conservatory Music in the Mountains hosts a festive concert featuring at least two of the concerto competition winners. With 99 musicians enrolled in this year’s session, Artistic Director Arkady Fomin has been able to field two substantial string orchestras, a varsity and junior varsity, if you will. The Chamber Orchestra opened the evening’s offerings with Schubert’s Overture in C minor. Fomin brought out the mysterious quality of the music by sustaining tension throughout and fiercely controlling the dynamics. The Conservatory’s Concert Orchestra, conducted by Gary Needham, showcased younger musicians. Three very different works provided expressive range from a complex mini-overture to a lyrical Scottish ballad and a humorous arrangement of American folk tunes. Faculty member Mark Rosenberg accompanied “Fiddler’s Stew” by stirring in whimsical percussion ingredients. The first of three soloists followed. Hyunjeong (Jenny) Kwak, 22, performed one movement from Haydn’s Cello Concerto No. 2 in D Major with the Chamber Orchestra. Kwak won first prize in the concerto competition held the previous Monday in Roshong Recital Hall where her remarkably intense performance almost exceeded the room’s acoustic limits. In the Community Concert Hall, however, her big sound seemed perfectly balanced with the orchestra. Kwak elegantly contrasted the work’s lyrical and virtuosic elements with calm confidence. After intermission, the second prize winner, pianist Diego Caetano, 23, performed Brahms’ “Fantasien, Opus 116.” Caetano played the turgid first movement with authority and shifted easily into the quieter Intermezzo, returning once again to big effects in the stormy third movement. When Conservatory Conductor Thomas Loewenheim led the Chamber Orchestra in the largest and longest work of the concert, a transcription of Grieg’s String Quartet No. 1 in G minor, Opus 27, he unleashed a sleeping giant. Grieg’s quartet translates well to a large string orchestra and has been performed around the world in this format. Loewenheim chose to perform three of the four movements, leaving the Romance: Andantino for another time. Still, the orchestra traveled through Grieg’s spellbinding landscape for 30 concentrated minutes. Loewenheim intensified the contrasts between agitation and lyrical calm, giving the overall performance a sense of vigorous inevitability. Loewenheim’s rather muscular interpretation engaged the musicians as evidenced by their concentration and the audience as evidenced by an instantaneous and long-lasting standing ovation. As I said, a sleeping giant. The concert concluded with two elegant tangos featuring violinist Chloe Trevor. Carlos Gardel’s 1935 “Tango Por Una Cabeza” may have sounded familiar to many as it has enhanced films such as “Scent of a Woman” and “Schindler’s List.” Translated, the odd title means: Tango, by a head, and refers to a man’s double addiction – betting on horses and women. If music is about obsession, tango is a perfect form. Accompanied by the Chamber Orchestra with Fomin conducting, Trevor brought out the sensuous nature of the work, leaning into phrases and playing an almost inaudible pianissimo. In a provocative pairing, Trevor played a second tango as an encore, spinning out Astor Piazzolla’s “Oblivion” as if it were made of mist. The choice of “Oblivion” had a bittersweet quality. Piazzolla admired Gardel’s music and wrote a score for the 1986 film “El exilio de Gardel.” In turn, Piazzolla’s tango with its melancholic sadness seemed a perfect farewell for all the young musicians attending this year’s Conservatory Music in the Mountains. Grand Prize: Jacqueline Audas, violin ($750). Audas will perform with Music in the Mountains Festival Orchestra on Saturday. First Prize: Hyunjeong Kwak, cello ($500). Second Prize: Diego Caetano, piano, ($250). Director Award: Katherine Audas, cello ($150). Audience Favorite (Conservatory Idol): Jacqueline Audas ($150). Special Recognition was given to violinist Clarice Collins for individual performance improvement throughout the years of participation at Conservatory Music in the Mountains ($100). Gala, Conservatory Music in the Mountains, 7:30 p.m., Friday, July 19, 2013, Community Concert Hall at Fort Lewis College. Works by Schubert, Haydn, Brahms, Grieg, Gardel and Piazzolla. Soloists Hyunjeong Kwak, Diego Caetano and Chloe Trevor; conductors Arkady Fomin, Gary Needham and Thomas Loewenheim. Tickets available by phone at 385-6820, online at www.musicinthemountains.com or at the festival office at 1063 Main Ave.
Today: “Elements of Rhythm,” chamber concert, 7 p.m., $15-$39, First Baptist Church, 332 E. 11th St. Mozart – selections from “The Marriage of Figaro”; Orff – “Carmina Burana,” Five Movements for 10 Wind Players; Mendelssohn – Octet for strings in E-flat major. 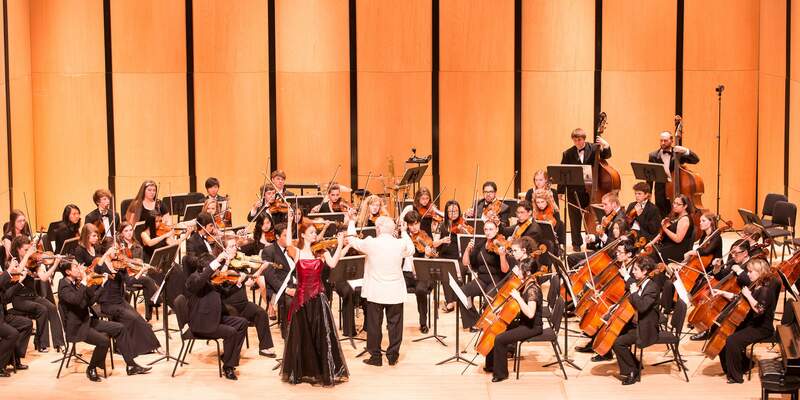 Next Generation IV, Conservatory young artists, 7:30 p.m., $10-$20, Roshong Recital Hall at Fort Lewis College. Wednesday: Clavier Trio, 7:30 p.m., $10-$20, Roshong Recital Hall at Fort Lewis College. Haydn – Trio in C; Kodaly – Duo for Violin and Cello; Smetana – Trio in G.